The focus on large oil tankers, which had proved so beneficial in the 1960s and early 1970s, became a millstone after the 1973/1974 oil price increase. No country was as badly affected by the shipping crisis as Norway, and the problems led to a massive reduction in the number of Norwegian shipping companies. This was matched by a strong decline in the Norwegian fleet, as ships were sold to foreigners or “flagged out” to low labour-cost registries. Tenold shows how the strategies backfired and explains why Norwegian shipping companies were particularly hard hit by the shipping crisis. The rationing of petrol reflected the dominant position of oil in the world’s energy consumption. An ever-thirstier world economy had come to rely on the Middle East to produce large amounts of low-cost energy. When some of the taps were turned off, the steady stream of cheap oil that had fuelled the post-war Golden Age was turned into a trickle of expensive energy. The price increase had dramatic effects for countries that produced oil (winners) and countries that imported oil (losers), as well as for the industries that used oil (just about every single one). Moreover, the oil market turmoil had a massive effect on the shipping companies that transported oil. A large number of these companies were Norwegian, and now their market collapsed more or less overnight. There is no doubt that the 1973 oil crisis and the concomitant energy shortage was a watershed in the development of post-war capitalism. As Marc Levinson has pointed out in a recent book, “an economic boom of extraordinary proportions” was replaced by “job loss, slower wage growth, and pockets of seemingly intractable unemployment” in most of the western world.2 The Golden Age had been characterized by extremely low unemployment and controlled inflation in all Western European countries. Now a new phenomenon, stagflation—high inflation and unemployment, coupled with low economic growth—presented businesses and politicians with new dilemmas. Income and productivity growth was more sluggish than before. Measures intended to reduce inflation were expected to push up unemployment, and vice versa. Very specific circumstances had created the Golden Age, something that was not obvious at the time. Instead, the sustained production and productivity growth of the 1950s and 1960s had given a renewed belief in the ability to engineer economic development and improve living standards. The only way was up. Consequently, in 1974 and 1975 it was not evident that the declining economic growth rates were permanent. Few observers and decision-makers realized that the world economy was going through a structural development break, rather than just another cyclical downturn, another temporary lull in growth. With the beautiful benefit of hindsight, it is very clear that the international economy was experiencing a negative structural shift, and it was a dramatic one. As Table 7.1 shows, there was a clear break in economic development after 1973.3 Economic indicators moved in the wrong direction. Politicians were confused and resorted to a long list of unsuccessful measures. Countries variously introduced import restrictions, deflationary budgeting, interest rate increases, higher value-added taxes, higher taxes in general, export promotion policies, expansive countercyclical policies, contractive austerity programmes, and so on. European governments used all the arrows in their economic policy quiver. They aimed in all directions. They hardly hit anything. The high economic growth of the Golden Age was replaced by much more sober growth rates. 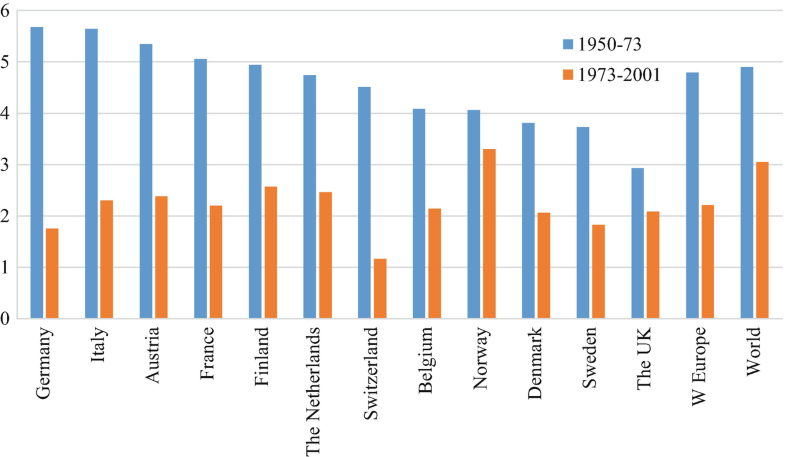 Norway was no exception to the shift, but in the first post-war decades Norway’s growth rates had been very much “middle-of-the-road” in a European perspective. Some even referred to “the Norwegian paradox”—despite very high investments, Gross Domestic Product (GDP) growth was decidedly average.4 However, the country’s emergence as an exporter of petroleum in the 1970s implied a softer landing than in most other countries. As Fig. 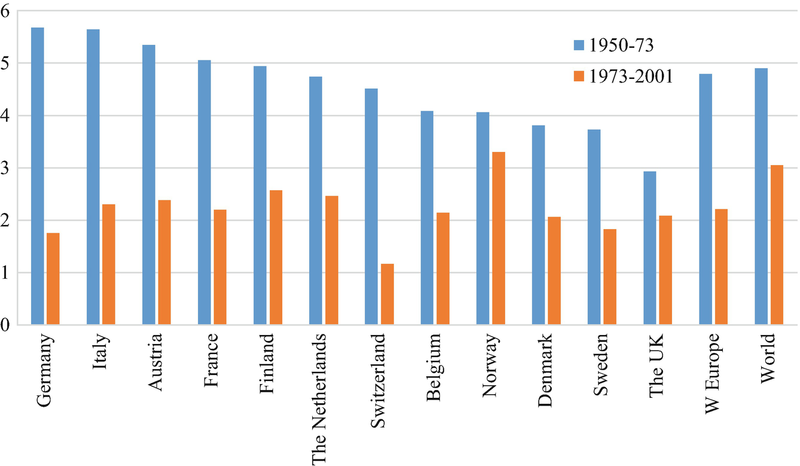 7.1 illustrates, Norwegian growth rates went from being below the Western European and world averages 1950–1973, to above these averages in the period 1973–2001.5 While economic growth in Western Europe was more than halved between these two periods, the decline in Norwegian growth rates was around 20 per cent. In the long term the oil price increase had a beneficial effect on the Norwegian economy, paving the way for the country’s advance towards the top of the list of the world’s wealthiest countries. For the Norwegian shipping sector, however, the effect was disastrous. As a result of the price hike, shipping was dethroned as the leading export sector, while the challenger— offshore oil production—became more powerful than it would otherwise have been. From the middle of the 1970s to the middle of the 1980s, the shipping sector went through a crisis that was longer, deeper and more dramatic than any other previous downturn.6 The tonnage surplus in the early 1920s was higher, but a profitable market returned relatively quickly, and the crisis therefore did not have any fundamental long-term effects. The problems during and after the Great Depression lasted longer than those in the 1920s, and the shipping sector had to cope with five years of high lay-up rates. Still, this was a shorter downturn than the one in the 1970s and 1980s. Moreover, the overcapacity during the 1930s was smaller, both in absolute and relative terms. In the short term, the shipping crisis was characterized by falling freight rates, increasing lay-up rates and vanishing shipping company profits. Freight rates in the tanker market declined almost instantaneously, with rates in the spot market for large tankers falling by more than 75 per cent from October to December 1973.7 Relatively soon, it became difficult to find employment even at the new depressed rate level—the oil companies reserved the cargoes for their own ships and those they had taken on long-term charters. By the beginning of 1976 more than 100 million dead weight tons (dwt) of tanker tonnage—almost 20 per cent of the fleet—had been laid up. The negative operating results—in many instances coming on top of high financial burdens—seriously depleted the shipping companies’ funds. Shipowners, desperate to get at least some income, accepted part cargoes and reduced the speed of their ships in order to lower fuel costs. Some ships were used for storage of oil and other cargoes, while a substantial part of the fleet was laid up without any employment at all. These measures soaked up part of the oversupply. In the Norwegian fjords and the bays and inlets of Greece, the large number of mothballed ships made the crisis in the sector evident even for the non-specialists.9 The tanker overcapacity peaked at more than 100 per cent in the spring of 1983. At that time, the basic demand was around 137 million dwt, while the fleet of tanker and combination carriers amounted to more than 300 million dwt. In other words, there were two ships for every cargo that needed transport.10 How did the market end up with such an imbalance? The oil price increase paved the way for a shock in the tanker market that exceeded the expectations of even the gloomiest pessimists. The consumption decline was in itself problematic. To make matters worse, the demand for tanker transport fell over and above this, in a period where there were expectations of growth. A 1970 report from the Norwegian Research Council presented a projection of expected tonnage demand in the future. Their base scenario was that a tanker fleet of 450 million dwt would be needed in 1985, with a low projection of 395 million dwt and a high projection of 505 million dwt.12 In reality, even the low-case scenario suggested three times more tonnage than what was actually needed. Given the enormity and unpredictability of the change—the term “oil shock” is used for a reason—it is easier to understand why the projections were so spectacularly wrong. We have to remember that the demand for oil transport had grown practically every single peacetime year for more than a century. Over the last 10 years before 1974, the annual demand increase had been around 17 per cent. What would be a likely “worst-case” scenario for development over the next decade? Even the Norwegian report’s “worst-case” prediction—where growth fell from 17 to 6.5 per cent annually—turned out to be way too optimistic. Within oil and shipping, practically everybody believed that the growth would continue. Anyone forecasting the actual development—a reduction in demand of almost 60 per cent from 1974 to 1985—would undoubtedly have been ridiculed and laughed out of the boardroom. 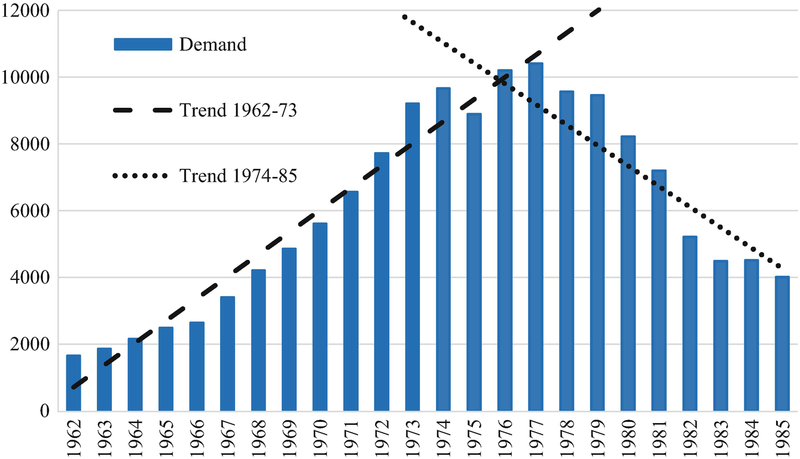 Figure 7.2 illustrates the dramatic shift in the development of tanker demand. In particular, the shift in the trend between the periods 1962–1973 and 1974–1985 is spectacular.13 The demand for tanker transport multiplied by a factor of more than 5.5 in the first of these periods. In the second, the initial stagnation was followed by a strong drop. Even though demand development, as seen in Fig. 7.2, is extremely dramatic, it tells only half the story. Due to the strong increase in demand before the oil price increase, and periodic shortages of tanker tonnage that had given some spectacular spikes in the rate level, tanker owners had large amounts of newbuildings on order when the demand collapsed. There was clearly no need for these ships when they were delivered—they only added to the already huge amount of superfluous tonnage. 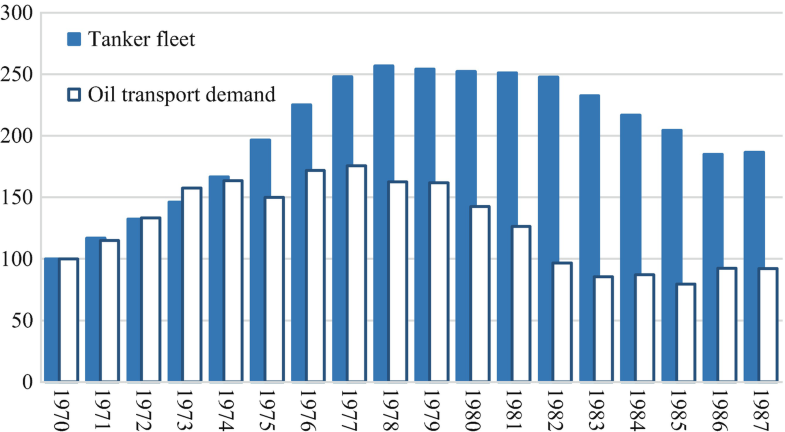 Figure 7.3 is an index showing the large and growing imbalance between tanker demand and supply during the crisis.14 It is evident that the initial problems, from 1973 to 1978, were caused by new deliveries of ships in a stagnating market. In the first half of the 1980s, there was a strong reduction of the demand for tanker transport, which even a gradual pruning of the fleet was unable to neutralize. By the middle of the decade, the demand for tanker transports had fully relapsed, matching the level it had held in 1967, which was more than 20 per cent lower than demand in 1970. The main problem was that there was more than twice as much tanker capacity to do the job. The problems from the tanker market spilled over to other shipping segments. The dry bulk market had initially developed positively—as oil became more expensive, there was a growth in the transport of relatively low-cost coal. However, the dry bulk market was soon flooded with combination carriers that were unable to find profitable employment within oil transport. As the 1970s progressed, the conversion of tanker newbuilding orders to other types of vessels added to the problems in other segments. Moreover, the shipbuilding countries’ subsidization of newbuildings—selling ships below construction cost in order to maintain activity in the shipyards—contributed to the contagion of the crisis. By the late 1970s not a single segment of the shipping market was untouched by the crisis. However, the problems were particularly strong in the tanker sector—the shipping segment that had been something of a Norwegian specialty for almost half a century. According to an old Norwegian proverb, “The sea gives and the sea takes.” This was what happened in the 1970s. When the international oil cartel, the Organization of Petroleum Exporting Countries (OPEC), raised oil prices in 1973–1974 and then again in 1978–1979, the effects on the Norwegian economy were ambiguous. First, the oil price increase implied a strong growth in the revenues from Norway’s nascent production of offshore oil. The price hike made North Sea oil vastly more profitable. Second, the sudden price increase signalled the start of a more than 15-year-long crisis in the main shipping markets. This depression hit Norwegian owners particularly hard. As a result of the OPEC-orchestrated oil price increase, the strategy that Norwegian shipping companies had successfully followed over the preceding decades became toxic. The Norwegian shipping industry had a particularly unfortunate fate due to its disproportionately high investments in tankers, and other strategic parameters amplified the problems. The compnaies had relatively new ships, relatively large ships and had refrained from ensuring employment through long-term charters. These were exactly the strategic choices that were punished most severely as tanker demand shifted from boom to stagnation, before completely collapsing. By following an expansive “economies of scale” strategy, with frequent replacement of tonnage by newer and larger ships, Norwegian tanker owners had been very successful in the growth period of the first post-war decades. During the Golden Age the demand for tanker transport had expanded rapidly. As oil consumption increased, oil fields far away from the consumption centres became more important and the 1967 closure of the Suez Canal added to the increase in average distances. When ships had to go around the Cape of Good Hope to carry oil from the Arabian Gulf to Europe, the existing fleet was unable to keep up with demand. As freight rates soared, vessel values increased rapidly as well. It is important to remember that second-hand values in shipping do not automatically follow the downward trend seen for most investment objects—machinery, buildings and cars. Instead, the value of shipping tonnage follows the freight rate cycle relatively closely, and might go up as well as down. The long-term decline in the value of a ship is typically portioned out over a period of 20–30 years, and variations from one year to the next might be much stronger than this trend—adding to the value or exacerbating the reduction. Consequently, if the timing is right, it is possible to buy tonnage, operate it profitably, and then sell it after several years at additional profit. The cyclicality had implications both for shipping companies and their sources of capital. In the period before the tanker market collapsed, ships were considered “floating real estate”—there were few instances of problematic loans to the shipping sector.15 Such price movements should make the shipping market particularly interesting for speculators and gamblers, but the majority of the participants at the time invested in ships with a long-term, operational focus. There were few instances of purely speculative newbuilding activity. This does not mean that shipping companies did not take risks. However, this risk was more related to the rate of expansion and the companies’ gearing (the proportion of loan finance, in other words the size of the debt relative to the equity), rather than to “speculative” investments aimed at taking advantage of variations in the value of the ship—so-called asset play. After the market collapsed, ship prices followed suit—and the flexibility of vessel values implies high speed on the way down as well as on the way up. A modern turbine tanker of 220,000 dwt, which was valued at more than USD50 million in 1973, was only worth USD23 million the following year. By 1975 the value had fallen to USD10 million—a reduction of more than 80 per cent relative to the peak two years earlier. The depressed market kept vessel values low. At the same time, the newbuildings that eager shipping companies had ordered during the heyday were delivered. The combination of falling demand and increasing supply created an imbalance that threatened the shipping sector’s existence in Norway. The Norwegian predicament can be seen as a negative reflection of the success in the preceding decades. Broadly speaking, the choices that made many Norwegian tanker companies successful during the Golden Age, came back to haunt them after the oil price increase. Table 7.2 compares the situation in Norwegian shipping with the international situation around the start of the shipping crisis. The second and third columns of the table provide what we today know were the “ideal” strategic parameters during the Golden Age and the shipping crisis, respectively. How can we explain the dominant Norwegian strategy, which was so eminently adapted to the Golden Age and failed so spectacularly when the market collapsed? In a macro-perspective, business strategies are determined at the point where the skills, resources and culture of a company meet and respond to constraints and incentives imposed from the outside. There might thus be both internal and external explanations for Norwegian choices. There are several internal candidates: perhaps Norwegian owners were more optimistic (or perhaps more naïve) than their foreign competitors? Maybe they were more willing to take risks, or evaluated risk differently, than shipping companies in other countries? Did their long legacy of tanker shipping make it difficult to see the alternatives, or did it make them consider the alternatives differently? Had their success made them speed-blind? Maybe they all looked at their neighbours, following each other—like sheep or lemmings—to the edge of the cliff and beyond? The questions above all hint at failures at the micro-business level. However, the basis for the Norwegian problems could be structural. There might be external explanations pertaining to Norwegian shipping in general that can explain the groupthink. In the previous chapter we saw that the Norwegian setting advocated investment in large tankers. Maybe the operating conditions—the political framework—limited the alternatives that Norwegian shipowners could consider? Did they just adapt rationally to a tax system that strongly encouraged reinvestment? Perhaps Norwegian owners were lured by cheap money, generous yard credits and unrealistic projections of transport demand? As is often the case, both explanatory angles are relevant. The focus on tankers clearly had a long pedigree. As we have seen, the pioneering tanker investments in the interwar period made the Norwegians stand out in an otherwise difficult market. In 1960—before the strong upsurge in tanker demand, and a decade-and-a-half before the market collapsed—132 of the 164 large Norwegian shipping companies (80 per cent) had invested in tanker tonnage. For 37 of these companies, there was no diversification at all—tankers were their only investment. In fact, though the Norwegian companies were “overexposed” to the tanker market in 1973, they had been even more so in 1960. In 1973 tankers made up more than 60 per cent of the Norwegian tonnage, compared with less than half of the world fleet.20 The only countries with more tanker tonnage were Liberia, the UK and Japan—but a substantial portion of the ships in these countries were owned by oil companies or trading houses that also owned the cargo. These ships were less affected by the tonnage surplus. Norway had since the early days of tanker shipping controlled the world’s largest independent tanker fleet, and this had been a profitable strategy. Long traditions can make it difficult for companies to consider alternatives, and changing strategies may be time-consuming—this is what business historians refer to as path dependence. Furthermore, long successful traditions can lead to hubris , the short-sighted—even blind—belief that the next boom is just around the corner and a failure to appreciate that this time it is different. This attitude was not confined to those involved in the study. At an overall level, Norwegian shipping executives were clearly optimistic about the tanker sector and willing to channel much of their resources into that market segment. The tanker strategy had served them well for decades: it was expected to serve them well in the future. Still, it would be wrong to blame only the shipping companies for the malaise. There was a structural basis for the crisis as well; an institutional setting that made the unfortunate strategic choices particularly attractive. Norwegian shipping companies had been eminently placed to reap the benefits of the expansion of seaborne oil transport. 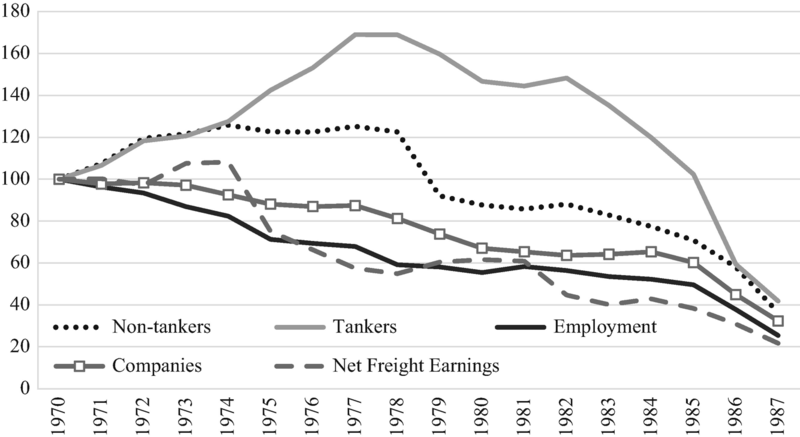 Cost increases had pressed the margins in the 1950s and the 1960s, but many tanker owners had experienced shorter bursts of spectacular revenues that made them forget the periods of low activity. Typically, the profits were reinvested in even more tankers, larger and more expensive than before. As we have seen, the main alternative for the shipping companies would be to pay dividends, which were heavily taxed. It was better to obtain even more profitable tonnage. As one shipbroker put it: “instead of letting the company pay more than 50 per cent tax on the profit from the sale of a ship, [many shipowners] prefer to build a new ship and use the profits for depreciation. In other words – to put it a bit bluntly – the taxman’s money is used for reinvestment.”22 The taxation of profits was high in an international perspective.23 If the company continuously reinvested its profits, however, the actual tax rate was close to zero. The institutional setting—where relative costs and the effects of the tax system encouraged frequent reinvestment in larger and larger ships—does not exonerate Norwegian shipping companies. Still, it explains why they had made the “wrong” choices, why supertankers were the favoured investment object. Moreover, just like these supertankers, the response time was very long if the companies wanted to change course. An ultra large crude carrier (ULCC) would need almost a minute to turn 20 degrees, and would move two ships’ lengths in the process.24 Norwegian shipping companies, with resources and competences vested in the tanker segment, could not jump from one strategy to another when the market collapsed. Due to existing ships and contracts, the course was set. And they were going in the wrong direction. Although the tanker market changed more or less overnight, the impact was not felt immediately by the shipping companies. The solid market in the first part of the year meant that many had record profits in 1973, and quite a large portion of the fleet was committed to charters that ensured revenues, at least for the next year or so. By 1975 it was evident that the crisis was dragging on. Any hope that the downturn in the shipping market was short-lived—like it had been in the late 1960s and in the early 1970s—was too optimistic. The most unfortunately positioned shipping companies had already been forced to have “the difficult chat” with the banks—their cashflows had dried up, and the drop in ship values had hit the balance sheets hard. The first major Norwegian owner to encounter serious problems was Hilmar Reksten. His enormous success in the period when the market was going up was overshadowed by his spectacular crash when the market collapsed. In the international press he was presented as a maverick, a shy and reserved tycoon, and a sober Nordic counterpart to the Greek playboys Onassis and Niarchos, whose flamboyant lifestyles filled the pages of the gossip magazines on both sides of the Atlantic. With a strategy focused on the spot market, Reksten’s ships rapidly became surplus to requirements. Moreover, Reksten had an extremely expansive newbuilding programme—ships that would come on stream in a market where there was absolutely no need for them. In May 1975, in a secret session, the Norwegian Parliament bought Hilmar Reksten’s shares in a large number of Norwegian and foreign companies to alleviate his financial problems. The secret decision to help Hilmar Reksten’s companies provided only short-term relief, though. His outstanding loans and newbuilding obligations were too high. From 1975 onwards, many tanker owners found themselves in a similar situation. Even a more far-reaching government solution was insufficient. By 1975 the crisis in the shipping sector had become so serious that the authorities saw the need for more far-reaching involvement. The expansive Norwegian newbuilding strategy had, to a large extent, been financed by means of retained equity and foreign loans. Many companies found it difficult to comply with the loan terms when revenues vanished, and therefore ended up in breach of their covenants. A particularly difficult element was the “minimum value clause”—a staple of ship financing contracts—where the lender could demand forced instalments, extra collateral or the sale of the vessel if the value dropped below a certain amount. As a result of the 80 per cent drop in the value of new ships, most expanding shipping companies were in trouble. Moreover, as a number of vessels had been ordered by partnerships—where two or more companies shared liability—the financial problems of one owner could quickly spread to others. Officially, the Guarantee Institute for Ships and Drilling Vessels Ltd. (GI) was established to alleviate this problem. When the government provided guarantees for the ships’ financing, the creditors no longer had any incentive to force the owners to sell. The premise for the GI was the idea that the crisis was a temporary phenomenon and that some sort of market failure for second-hand ships justified government intervention. The aim of the GI was to ensure that tonnage was kept under Norwegian ownership, rather than sold abroad at prices that did not reflect the long-term value. Assets were to be kept on Norwegian hands until their fair value could be recouped. With vessel values in free fall, very few of the modern, mortgage-financed ships did not violate the minimum value clause. Some shipping companies were in a financial situation where they were able to negotiate with the banks, using lucrative long-term charters or alternative assets as collateral. For other shipping companies, typically those with a large share of tonnage laid up and high financial exposure, the GI provided the financing institutions with guarantees that the mortgages would be honoured. The authorities thus bought time for the shipping companies until values recovered. However, the politicians clearly had ulterior motives. Among those that would benefit from the arrangement were Norwegian shipyards, and in particular the Aker group. The Aker group had expanded massively, and a large share of its orders were related to three shipowners— Biørn Biørnstad & Co., Hagbart Waage and Hilmar Reksten—who had taken the Norwegian large-tanker, spot-market operation strategy to an extreme level. If these shipowners failed, it was likely that the Aker group, Norway’s largest manufacturing employer, would be caught in the slipstream. Throughout the post-war period, ship financing had been one of the most important links between the Norwegian and international financial markets. A wave of shipping bankruptcies would undoubtedly harm Norway’s reputation internationally, something that would be very problematic for a country that depended upon foreign funding to build up petroleum production in the North Sea. Again, government guarantees bought time and solved the immediate problem. In the end, however, the Guarantee Institute was a band aid on an open wound. The shipping market did not recover as expected. Consequently, the ships that the guarantees covered never regained their fair value—this was a concept that only existed in the heads of politicians and bureaucrats, and certainly not in the market place. In the early 1980s the arrangement was largely disbanded, at a significant loss to the Norwegian tax payers, though the GI lived on in the Norwegian court system well into the new millennium. The GI, the most far-reaching government involvement in shipping in peacetime, was not a success, but an expensive lesson. The unfortunate end result can be explained by the depth and, in particular, the longevity of the tanker crisis.26 In fact, for the drilling rigs, which had been included in the arrangement due to challenges that were identical to those in the tanker market, the scheme was an unconditional success. Demand picked up, the rates recovered—and the vessels regained their value. For shipping, a brief market upturn around the turn of the decade turned out to provide only very temporary relief. In the 1980s the crisis broadened, affecting new market segments and new companies. By the middle of the decade there was hardly a single company that had a solid financial situation, and many had already been forced to give up. 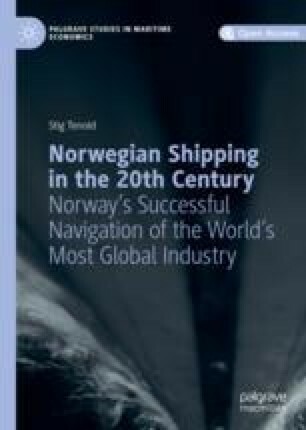 The shipping crisis had profound effects on the Norwegian shipping industry and led to several structural changes.27 The industry became more concentrated in the major shipping centres, Oslo and Bergen. Many smaller ports along the coast saw their last ocean-going ships disappear—scrapped or sold abroad as a result of lost competitiveness. There was also a concentration of ownership in general. Most of the large shipping companies survived the crisis—often at the mercy of their banks, and with original ownership heavily diluted. For smaller companies, it was more difficult to convince the creditors that the best strategy would be to keep the company alive. Many of the banks that entered ship financing in the late 1960s and early 1970s—enticed by the upward trend in asset prices—wanted to withdraw quickly and cut their losses, when their fingers were burnt. 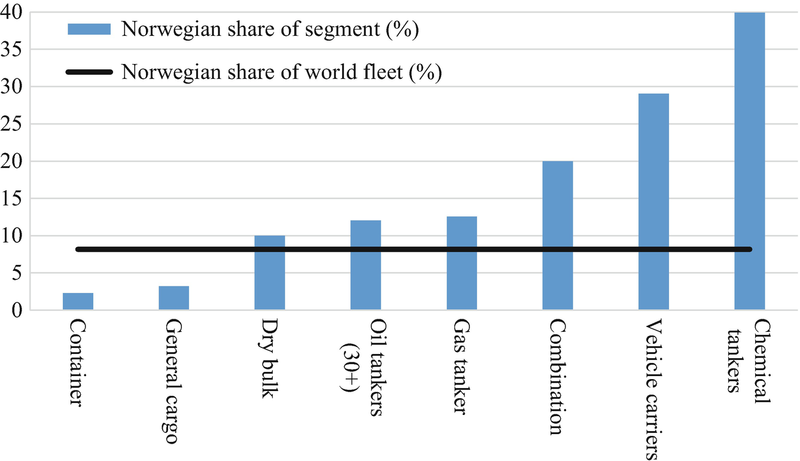 Figure 7.4 presents five indices that show the decline of Norwegian shipping along several dimensions—tonnage (tankers and total), the number of shipping companies, employment in foreign-going shipping and net freight earnings.29 The extent of the decline over the period varies—from almost 80 per cent in the case of net freight earnings, to slightly less than 60 per cent in the case of the tanker fleet—but it is evident that all indicators developed very unfavourably.30 At the same time, the indices show different development patterns. These can be used to explain the unfolding of the crisis and how it manifested itself in Norwegian shipping. The tonnage data reveal the optimism at the start of the decade. The fleet growth is relatively similar for the tankers and for the fleet as a whole in the period 1970–1973. Subsequently, the tanker fleet starts to grow more rapidly, reflecting the high ordering during the boom. At the peak at the beginning of 1977, the tanker fleet had increased by 69 per cent relative to 1970, while the non-tanker fleet had increased by about a quarter. The fact that the tanker fleet continued to grow for four years after the freight market had broken down, can be explained by the lag between the ordering and delivery of vessels. Such lags are particularly long during boom periods such as in the early 1970s—the amount of tanker tonnage on order more than trebled from 1970 to 1974. The indices also reveal the strong relationship between the shipping cycles and the fleet development. There was a short reversal of the post-1977 fleet decline in 1982. This atypical growth in a period of practically constant decline was a result of vessels ordered during a brief improvement in freight rates. In 1979 and 1980 lay-up rates declined to around 3 per cent—after having been more than 10 per cent the previous year and more than 20 per cent in 1977—and freight rates increased markedly. The effects are seen both in the levelling out of the freight earnings during 1979–1981 and in the deliveries of new tonnage in 1982—by which time there was already a tonnage surplus again. The number of companies remained relatively steady during 1971–1973, before a downward trend and two “waves” of liquidation set in; the first from 1977 to 1979 and the second from 1984 to 1987—and the last one was particularly violent. Around 25 per cent of the companies that existed in 1985 had disappeared by 1986, and the rate was even higher from 1986 to 1987. Again, the optimism caused by the freight rate increase around the turn of the decade explains the temporary break in the declining trend. The crisis itself reduced the number of shipping companies with vessels flying the Norwegian flag from 176 to 56—or 64 if we add the ones that had invested in drilling rigs and large vessels for the offshore oil industry.32 When companies that operated ships under foreign flags are included, the number increases to 91, but even that implies that the number of Norwegian shipping companies had been almost halved. It was shipping itself that killed off the Norwegian shipping companies. There was little or no tradition of diversification outside the shipping sector. Such conglomerates were far more common in, for instance, the UK. Some of the larger Norwegian owners had separate investments in other industries, and quite a few had ventured capital into the offshore oil business, but in general the companies stuck to their main activity—shipping. Of course, this was unfortunate when that market was in trouble. However, in other countries, large conglomerates—with shipping as one of their many activities—were no guarantee of success. In fact, the activities in other sectors might have exacerbated the difficulties. Diversification strategies enable shipping companies to spread risk, as revenues from relatively well-functioning markets could neutralize, or alleviate, the negative effects from the depressed ones. Among the markets that were less affected by the crisis, at least at the outset, were those involving specialized ships such as car carriers, gas tankers, chemical tankers, cruise vessels and so on. Figure 7.5 compares the Norwegian share of the world fleet with the share of some of the main segments.38 The low shares of containerships and general cargo carriers, as well as the previously presented overrepresentation within the tanker market, are clearly visible. However, it is evident that the Norwegians had an extremely strong position in some of the niche segments. The introduction of specialized vessel types had been one of the dominant technological trends in the first post-war decades. When the crisis hit shipping markets hard, specialization turned out to be a relatively safe haven. Although the markets were thinner, there were profit opportunities and the number of competitors was relatively limited. Compared with more mature markets, there were substantial barriers to entry—it was more difficult to acquire the technology and gain market share. This gave the shipowners with special vessels some breathing space. The cashflows were less volatile and typically more predictable, as the companies had usually secured some activity through long-term contracts with their main industrial customers. Moreover, specialized ships were often operated in pools, where revenues were distributed among participating ships according to a fixed set of “pool keys,” another mechanism that evened out fluctuations in shipping incomes. The increasing importance of specialized shipping has two—quite related—explanations. First, the role of the specialized ships, and the shipping companies owning them, automatically increased as major tanker and dry bulk owners folded and other ship types disappeared from the fleet. By default, what remains increases in relative importance. Second, it is evident that the specialized market segments were well-suited to two of the main competitive parameters of Norwegian shipping companies— competence about markets and customers, and access to relatively cheap capital. Shipping companies that invested in these segments were thus able to expand in absolute, as well as relative, terms. As there were economies of scale at the fleet level—sometimes a fleet of 10 or more ships was necessary to provide an efficient service—the specialized segments frequently saw various types of cooperative strategies; partnerships, joint ownership, pools and so on. One common combination was cooperation between innovative entrepreneurs and established companies. Perhaps the best example of this is the open-hatch bulk market, where ships with completely box-shaped holds, extra-wide hatches and special cranes offered transport of tricky products such as pulp, paper, wood products and so on. In the 1960s, two cash-strapped entrepreneurs—Per Waaler and Kristian Gerhard Jebsen—established the Star and Gearbulk pools together with far wealthier compatriots, including some of the companies that were among Norway’s 20 largest companies in the interwar period (Westfal-Larsen and AS J.L. Mowinckels Rederi). The specialized segments were characterized by innovative solutions. One of Odfjell’s selling points in the chemical tanker market was the use of stainless steel tanks, which increased the number of cargoes that could be transported, including highly corrosive products such as sulphuric acid. The ships that performed industrial shipping services were expensive—in the late 1960s a 10,000 dwt chemical tanker was twice as expensive per ton as a conventional tanker of the same size. Compared with a 200,000 dwt tanker, the chemical tanker was six times more expensive per ton.40 The companies that invested in specialized shipping often had a “value-chain” approach, where the aim was to provide a first-class, integrated service to their main customers. As a result, both Odfjell and Stolt-Nielsen invested in tank terminals that would improve their competitive position—and make it difficult for new competitors to enter the market for the transport of chemicals. In several of the specialized segments, Norwegian shipping companies and yards came to play a decisive role in the early development of the technology and the market. The first open-hatch bulk carrier— Besseggen—was developed by US naval architects, but built by a Norwegian yard, owned by a Norwegian shipowner, equipped with purpose-built Norwegian cranes and chartered long-term to a US industrial conglomerate. Within liquid natural gas, the technological development was a process that took place “in an interplay among shipping companies, research institutions, shipyards and subcontractors.”41 Table 7.3 presents some of the niches in which the Norwegians played an important part in the technological development, and also managed to gain substantial market shares. As previously mentioned, specialized shipping was the viable alternative to bulkification for Norwegian companies. But the ability to invest was not equally distributed; the specialized segments were expensive, involved trial-and-error and initially entailed substantial risks. The shipping companies that built up a presence had to have a strong position vis-à-vis customers and shipbuilders. Again, the ones best suited were the large shipping companies, or the entrepreneurs that managed to get a financial contribution from the large shipping companies. If we take company size in 1960 as the starting point, more than a quarter of the companies in the top half of the distribution invested in specialized tonnage in the period 1960–1977, compared with less than 10 per cent in the lower half of the size distribution.42 The fact that specialized markets were relatively well-functioning thus increased the degree of concentration in Norwegian shipping. Specialization also brought about new regional differences. A century earlier, Bergen had been ahead in the transformation from sail to steam, but had been outgrown by shipowners in other parts of Norway—in particular Oslo—after the First World War. The Bergen shipowners regained their pioneering position as a result of specialization; by the middle of the 1970s, they owned 13 per cent of the Norwegian fleet, but more than 40 per cent of the specialized tonnage. The position was particularly strong within chemical shipping and open-hatch bulk shipping. The investment in specialized tonnage gave the Norwegian shipping industry some breathing space during the crisis. In the specialized segments, there was still room for innovation—so investment did not dry up. Moreover, the fact that the technology was quite advanced, meant that shipping companies could justify paying more for the competence that Norwegian seafarers brought to the table—or to bridge and deck. In a period when the Norwegian shipping industry had serious financial problems, the specialized shipping segments performed relatively well. However, as the crisis dragged on into the 1980s, many of these segments became plagued by overcapacity as well. After a century of success, Norwegian shipping reached a low point during the shipping crisis—in terms of profitability and in terms of public perception. Norwegians had eagerly embraced the country’s new-found role as a petroleum producer, and the country’s wealth and welfare soon became identified with the export of oil, not with shipping services. On the West Coast, in particular in and around Stavanger and Haugesund, “sheikhs and Arabs” were the new royalty. Shipping was rapidly eclipsed by the oil sector in the public’s impression of where Norwegian wealth came from. This idea was strengthened by the notion that even in the period when shipping was important, shipowners had been shirking their responsibilities. In the second half of the 1970s, tax-evasion charges related to two of the leading shipping personalities— Anders Jahre and Hilmar Reksten—had a negative effect on the public’s attitude towards shipowners and shipping. Jahre and Reksten had previously been portrayed as philanthropists and entrepreneurs, who had contributed to building the nation with their work ethic and risky investments, before sharing the profits for the common good. Jahre financed half of the town hall in his native Sandefjord, and donated substantial amounts of money to research and humanitarian purposes. Reksten ensured that the sailing vessel Statsraad Lehmkuhl, which was used as a school ship, remained in Bergen, and gave large amounts of money to cultural events and buildings, as well as several other causes.46 Their generosity was tainted by the fact that they had been quite tight-fisted in connection with their tax payments. In the 1980s, controversial business decisions continued to put the country’s shipping companies in a bad light. Dangerous voyages in the Persian Gulf, where oil tankers were common targets in the Iran-Iraq war, made the shipowners involved seem cynical and ruthless. Moreover, “amoral” transport of cargo to and from South Africa made it easy for a critical press to paint a picture of shipowners as profit-hungry and heartless.48 There is, however, another adjective that would have been more appropriate: they were desperate. This desperation was evident throughout the shipping industry. Only a relatively limited number of shipping companies traded on ports in the Persian Gulf or South Africa, but the problems were felt everywhere. The crisis affected the industry so broadly that practically all shipping companies were looking for a way out. Shipping had become “an industry with high risks and low profits” and this put pressure on the limited equity that remained.49 The downturn in the market had forced the authorities to gradually increase access to register ships abroad, in order to reduce costs. Some shipping companies reflagged their vessels and replaced their Norwegian sailors with foreigners, but that was not the dominant strategy. The most common response to the shipping crisis was simply to give up. Norwegian shipping was on its knees—its position was weaker than it had been at any time over the past 100 years. A large portion of the fleet had been sold abroad, despite the expensive GI, the governments’ attempt to give emergency relief to struggling shipowners. International shipping under the Norwegian flag was slowly and surely dying out, as companies gave up or fled abroad. However, in the darkest hour, help came from the most unlikely of quarters. Levinson (2016, 3 and 8). Calculated by the author based on OECD (1977, 70; 1999, 45). Unemployment figures refer to 1960–1973, 1974–1979 and 1980–1989, respectively, and only refer to the United States, Japan, Germany, France, Italy, the UK and Canada. Figure 7.1: Calculated on the basis of data from Maddison (2003).The charts refer to compound average growth of GDP , measured in fixed prices and based on purchasing power parity (PPP)—see the source for details. The 12 countries included in the category “Western Europe” are Austria, Belgium, Denmark, Finland, France, Germany, Italy, the Netherlands, Norway, Sweden, Switzerland and the UK. In Tenold (2000, 332–333) it is suggested that it might be useful to consider the problems as two distinct, but related, crises. The first one was caused by demand stagnation and tonnage growth, the second one by an absolute reduction of tanker demand that aggravated the situation even further. Such a distinction makes sense in a long and detailed analysis of the problems of the 1970s and 1980s, but does not add much to our broader presentation. The spot market is the most inelastic part of the shipping market, where ships are hired on a voyage-by-voyage basis. In periods of tonnage shortage, the sky is the limit. Calculated on the basis of the rate from the Persian Gulf to the UK/Continent, monthly figures, from Fearnley & Egers Chartering Co., Review 1973, 23. See Todd (1981, 2011) and Bruno and Tenold (2011). In Chap. 4 we looked at the success of Sweden and Denmark in interwar shipbuilding. When the market collapsed, the trajectory of shipbuilding in these two countries was very different; see Stråth (1987) (for Sweden) and Poulsen and Sornn-Friese (2011), Poulsen (2013) and Olesen (2013) (for Denmark). At one point in the early 1980s, more than 400 ships were laid up in Eleusis Bay, a sheltered basin relatively close to the Greek shipping centre, Piraeus. Jenkins, Stopford and Tyler (1993), Tables III.12–III.25. Around a quarter of the surplus was neutralized by the acceptance of part cargoes, ships used for storage and waiting time in ports. More than 30 million dwt of tanker tonnage was laid up, while the rest of the surplus was absorbed by slow-steaming ships. Farrell (1985, 381), Ahrari (1986, 37) and British Petroleum (1984, 7–8 and 16). Dahl (1970, 18). The source of the chart showing the estimated tonnage demand in the report from the Norwegian Research Council is simply listed as Det norske Veritas. Clearly, the researchers were too busy to predict the future to be interested in proper referencing. Figure 7.2: Calculated on the basis of the demand for the transport of crude oil in Fearnley & Egers Chartering Co., Review, various issues, Table 2. Figure 7.3: Calculated on the basis of the demand for the transport of crude oil and oil products measured in ton-miles, as well as the fleet of tankers measured in dead weight tons, in Fearnley & Egers Chartering Co., Review, various issues, Tables 2 and 3. See Stokes (1992, 25)—and keep in mind that Peter Stokes wrote this in a period when a decline in the value of real estate appeared far-fetched. Today, the metaphor is less convincing. Based on their experiences in the middle of the 1990s and during the 2008 financial crisis, owners and banks in Europe and the United States are fully aware that there are risks involved in real estate investments. They have learned the hard way. See Koopmans (1939) and Zannetos (1966) for the theoretical and historical view, and any chart of the tanker market showing the development over the last five, 10, 15 or 20 years to confirm that the old ideas are still valid. Based on price information in Fearnley & Egers Chartering Co., Review, various issues. Table 7.2: Compiled on the basis of a variety of sources from the first part of the 1970s. See the comments to the individual series for details. Tanker share refers to gross tonnage of oil tankers and combination carriers above 100 gross tons from Lloyd’s Register of Shipping Statistical Tables 1973, Table 2 and is therefore a conservative measure. Average tanker size (1000 dwt): data for vessels above 10,000 dwt in 1973 from Review 1973. World fleet figures include the Norwegian fleet. Again, this is a conservative measure. Based on the data from Lloyd’s Register of Shipping Statistical Tables 1973, Table 2 the average size of the Norwegian tankers and combination carriers (37,754 gross tons) is more than twice the average size of the non-Norwegian tankers and combination carriers (18,345). Orderbook as share of the fleet (%): Data for 1974, from Review 1974. This year was chosen in order to neutralize the effect of newbuildings cancelled after the freight market broke down. World fleet figures include the Norwegian fleet. Average size orders (1000 dwt): data for 1973 for tankers above 10,000 dwt in 1973 from Review 1973. Supertanker share (%) based on Lloyds Statistical Tables 1973, Tables 3 and 8, calculated on the basis of gross register tonnage. The share refers to the tonnage of tankers larger than 100,000 gross register tons as a proportion of the total fleet. Turbine tanker share (%): data for 1975 calculated on the basis of Statistics Norway (1984, 45 and 102). Average age (years): data for 1974 from Lloyd’s Register of Shipping Statistical Tables 1974, Table 8. The average of the age groups is used when the data are weighted on the basis of tonnage. Spot market share (%): data from 1973 from Jenkins, Stopford and Tyler (1993, 82–95). World fleet does not include Norwegian fleet. Unfixed newbuildings (%): data from January 1974 from the Norwegian shipbroker Johan G. Olsen; see Tenold (2000, 185–191). When we look more closely at propulsion—the share of turbine tankers, which is the only factor where Norway did relatively well—the situation was less positive than it appears from the table. If we include the propulsion of the ships on order, even this last indicator becomes unfavourable from a Norwegian perspective. The proportion of turbine-driven vessels in the Norwegian fleet increased from 30.8 per cent in 1975 to 38.2 per cent three years later. Over the same period, the proportion for the world fleet fell from 35.5 to 33.3 per cent; see Tenold (2000, 165). The Liberian share was marginally more than 70 per cent, but much of this was owned by oil companies and ensured employment. Liberian lay-up rates in the second half of the 1970s were less than half of the Norwegian ones; Tenold (2000, 153–155). The analyses were subsequently published elsewhere; Lorange and Norman (1972, 1973). Interestingly, the two academics behind the survey later became involved in the shipping industry, at the Board and ownership level. They had considerably more success than the majority of their research objects, more than half of whom had gone out of business 10 years after the study—see Norman (2012, 207). Gram (1979, 110). Access to depreciation exceeding 100 per cent of the value of the contract or accelerated depreciation made reinvestment extremely favourable and ensured a strong link between policy and strategy. A comparison from the early 1960s suggests that Norwegian taxes were 40 times higher than those shipping companies using the Liberian or Panamanian flag would pay; Seland (1960, 11). Still, the ban on contracting from 1949 onwards indicates that this political priority was not an absolute right—the policy sometimes changed at short notice. However, given that the Aker group survived, and Norway’s international financial standing was unhurt, the question of whether the arrangement was a success or not could be modified. For an impressively pedestrian walk-through of practically every change in companies and ports from 1970 to 1987, see Tenold (2000, 258–330). Tenold (2006, 130–132). The starting point here is 105 companies in 1939, whereas Chap. 4 suggests that there were 107 tanker companies that year. The difference is due to the fact that four companies that merged in the period 1939–1970 have been counted as two companies in the 1939 figure. Tonnage data: Statistics Norway (1994, 481). Based on the gross tonnage of vessels larger than 100 gross register tons. Number of shipping companies: calculated on the basis of the data set presented in Tenold (2000, 278–308), covering all Norwegian shipping companies that owned vessels larger than 5000 gross register tons. However, relative to the figures presented there, companies that only owned drilling vessels have been deleted. Employment: crew on board vessels registered in the Norwegian ship register, foreign-going trade only. In 1980 the reporting of employment figures changed, when seafarers on smaller ships and restaurant personnel on crew ships became included in the public statistics, and the data have been adjusted to neutralize the effects of this change. Net freight earnings: Statistics Norway (1994, 545), deflated by Grytten (2004). Net freight earnings provides a better reflection of the contribution of shipping to the Norwegian economy than gross freight earnings, as it deducts expenses accrued abroad, and thus shows how much money shipping companies “brought home,” In the period, the proportion of gross freight earning that was brought home was halved, from around 60 per cent in the early 1970s to around 30 per cent 1982–1987. This partly reflected a structural change, towards shipping segments with a higher proportion of costs abroad, and partly the fact that prices abroad had less downward flexibility than freight rates. If we compare with the peak, rather than 1970, the decline in the tanker fleet is more than 75 per cent. The analysis of companies is based solely on those companies that have ships larger than 5000 gross register tons; see Tenold (2000, 258–267) for a presentation of the databases that are used. Companies that owned smaller vessels, engaged in local trades or the offshore industry, have not been included in the analysis. These figures are likely to be somewhat inflated due to temporary exits, temporary establishments by existing companies and companies established by creditors. Among the “shipowners” in the data set are several banks. In fact, the company’s shipping business contributed positively to its accounts, and the Court Line also sold two newbuilding contracts at a substantial profit before the market crashed; Court Line Limited, Report of the directors & accounts for the year ended 20 September 1973, 7. See also Craggs, Murphy and Vaughan (2018, 117–119). Goss (2013, 247–248). See also Simons (1997). Calculated on the basis of the database mentioned above. Around 15 per cent of the shipping companies only owned crude oil tankers, and were thus particularly badly placed when the oil price increased. In total, 53 per cent of the companies had invested in oil tankers—as previously mentioned this was down from more than 80 per cent in 1960; see Tenold and Aarbu (2011, 241). There is one exception to this intuitive claim: companies that own combination carriers, ships that can be used both in the tanker and dry bulk markets. In the analysis, companies with such vessels are considered to follow a diversification strategy. Calculated by the author on the basis of Lloyds, Statistical Tables 1973, Table 2 and Norway, Parliament, 1983, 103–108. Refers to tankers larger than 30,000 gross tons; for all other vessel types, it refers to all ships larger than 100 tons. Calculated on the basis of the companies’ fleets in 1977; see Tenold (2010, 75). Tenold (2010, 72). However, as we saw in the last chapter, smaller companies had an inroad into the niche markets by means of minority investments in ships owned by the larger companies. See Tenold (2009) for a more thorough analysis. The choice of a masculine pronoun here is a result of reality, not misogyny. In the first half of the 1970s women made up less than 10 per cent of Norwegian seafarers in ocean transport. Among foreigners on Norwegian ships, the female share was less than 5 per cent. See the discussion in Tenold (2015a). Given their important roles as entrepreneurs, businessmen and donors, as well as their spectacular falls from grace, Jahre and Reksten have been the subject of a number of books, some emphasizing their former successes, others their downfall. See for instance Jacobsen (1982) and Tjomsland (2013) (for Jahre), Ilner (2006), Hjellum (1983), and Reksten (1979, 1983) (for Reksten), and Gram (2017) (for both). For an early and extremely good analysis of the industry’s image problem, see Svendsen (1976). The transport of oil to South Africa was not illegal, but such voyages “were considered morally and politically unacceptable”; Eriksen and Krokan (2000, 199). In 1985, Parliament suggested a system of registration of all Norwegian-owned ships trading on South Africa, and a watered-down version of this procedure was introduced. Although relatively few companies participated in the transport—23 crude oil voyages to South Africa were registered in 1986–1987, but only six different shipping companies were involved—the whole industry was tainted by the actions of the few. Moreover, “the shipowners were a visible target and an ‘enemy’ [that was] easy to identify and attack,” a fact that was used strategically by anti-apartheid activists; see Eriksen and Krokan (2000, 213–214). The Bahamian merchant marine ensign has red fields with a white cross, like a symmetric version of the Danish flag, but the flag of the Bahamas in the upper left quadrant.